Some of our clients like the way they look with their glasses on. Others choose to wear contact lenses instead. Contacts are a great option for those who prefer their own natural appearance, but still need vision correcting lenses. Some people with certain eye diseases see significantly better with contacts, these include anisometropia, irregular astigmatism and corneal issues including keratoconus, pellucid degeneration or corneal transplants. 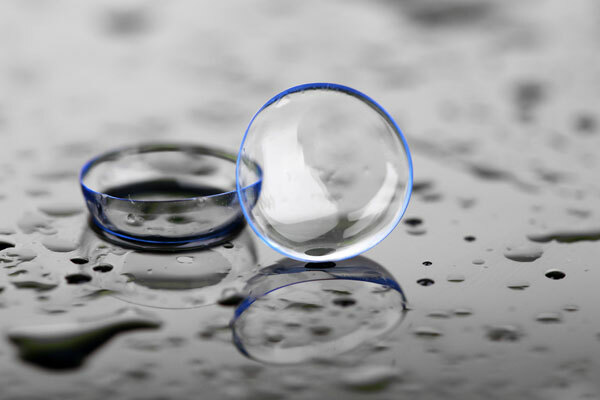 Soft Gel Lenses – These are made of water and a plastic gel-like material. They are comfortable, and last between a day and a year depending on the specific material. GP Lenses – Gas Permeable lenses are made of harder plastics and usually provide better focus. Often those with special needs do better here. Hybrid Lenses – A combination of GP lenses and soft gel contacts. These are a mixture of both but generally are reserved for those with specific conditions. Some of our clients have a difficult time finding contacts that fit. An injury or illness can damage the shape of the eye. For keratoconic patients and those who have recently had surgery, specialty lenses can be fitted for them. It really depends on the style you select. Some of our clients only want contacts to wear on special occasions. Others depend on their contacts daily. In the past, a contact lens had to be removed at night and reapplied in the morning. Now contact lenses are available that can be worn for several days at a time. Cleaning and maintenance are essential to prolong the life of your lenses and to prevent infections, but lenses do not last forever. Single use contacts must be discarded within a day. 7 days of continuous wear is common for more durable styles, but FDA restricts any contact from being promoted as lasting more than 30 days without removal and cleaning. You will need to replace your contacts periodically. The most durable types will last up to six months through repeated uses with proper care. When you are ready to see clearly without the hassle of managing your eye glasses, make an appointment to get fitted for a set of contact lenses. Call our office at (703) 578-3600.